It's again a good news for all the Nepali Cricket Fans out there. Sandeep Lamichhane, leggie has been snapped by Lahore Qalandars in upcoming fourth season of Pakistan Super League (PSL). Yes you heard it right! In the draft of Pakistan Super League (PSL) organized for this season Sandeep Lamichhane has been selected. He was been placed in Gold category in the auction. Yet how much amount Sandeep will be paid is not fixed, If sources are to be believed he will be getting 50K USD to 70K USD. However in the third season of the same series Lamichhane was placed in Silver category yet remained unsold. In this very same season, our own Sompal Kami has been categorized for Silver category but remained unsold. This is what Lahore Qalandars said in their Facebook Page. Again in the next league i.e Indian Premier League (IPL) in which Sandeep Lamichhane had played previously for Delhi Daredevils has retained him for the next season. 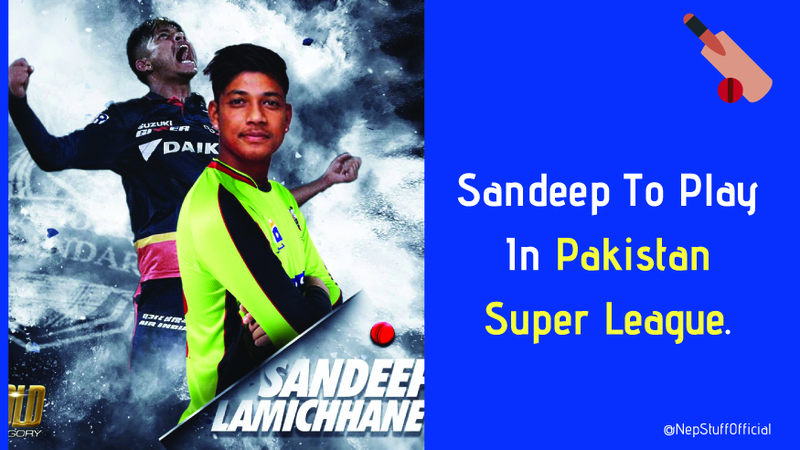 Sandeep Lamichhane played in differnet international leagues like, Indian Premier League (Delhi Daredevils), Afghan Premier League (Nangarhar Leopards), Bangladesh Premier League (Sylhet Sixers), Big Bash League (Melbourne Stars), Carribean Premier League (St. Kitts and Nevis Patriots) and more.